“There will be no solemn celebrations in the Vatican for the Pope’s birthday. Instead, it will be a family celebration. “I do not want any big celebrations please,” the Pope himself said to us collaborators.” This was revealed exclusively to Italian weekly magazine Gente on sale 16 April, by Mgr. Georg Gaenswein, Benedict XVI’s private secretary. On 16 April the Pope will celebrate his 85th birthday and three days later, on 19 April, he will begin his eighth year as Peter’s successor. “16 April is a Monday, a normal working day and he never interrupts his daily routine. It will however be a very Bavarian day,” Mgr. Gaenswein added. The Pope dedicated his book Benedict XVI – Famous figures write about the Pope – in which twenty VIP’s give personal descriptions of the Pope – to Mgr. Gaenswein. On the first day of Lent, the Pope will visit the Basilica of St. Sabina for the celebration of the Blessing and Imposition of the Ashes and the Roman Station Liturgy and Penitential Procession. 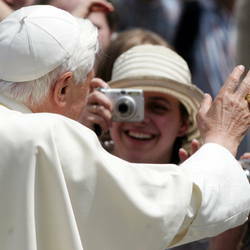 Benedict XVI will hold a Mass in St. Anselm’s Church in Rome. Benedict XVI will then lead the procession on to the Basilica of St. Sabina, where Mass will be celebrated and the Blessing and Imposition of the Ashes will take place. Cardinals, archbishops, bishops, Benedictine monks from St. Anselm’s and the Dominican Fathers of St. Sabina will all be participating in the procession and the mass.